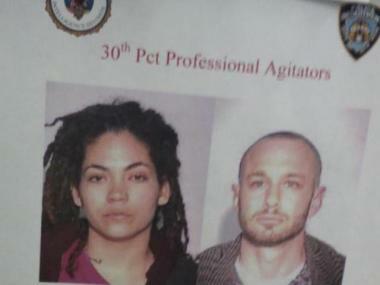 HARLEM — A new video taken by activists who were branded "professional agitators" for filming police stops — and shown on an NYPD "Wanted" poster at their local precinct — appears to show officers monitoring the pair's Harlem apartment building. It appears police were keeping an eye on several anti-stop-and-frisk advocates outside the couple's home following a meeting at the activists' home Tuesday night. Matthew Swaye, 35, and his partner Christina Gonzalez, 25, said they were escorting 10 people from their apartment at about 11:30 p.m. Tuesday after a meeting of the group called Stop Stop-and-Frisk, when three police cars from the 30th Precinct, with two officers each inside, pulled up in front of their building and blocked the street. A photo of police appears to show officers shining a light that may have been part of a recording device, the activists claimed. The officers, who did not get out of their vehicles, said they had received a call about loitering and trespassing at the location, the pair said. When confronted by the group of activists, one of the officers, a captain, pulled out a device and began filming, according to Swaye and Gonzalez. An NYPD spokesman confirmed that police received a 911 call shortly after 11 p.m. for a trio of teenagers trespassing at the building. Cops responded to the scene to investigate but determined that there was no situation at the address, the spokesman added. "If someone called 911, do your job. Why are you sitting here harassing people?" Gonzalez can be heard telling officers in the video. "You’re intimidating us by sitting in front of our building and pulling out cameras. Your captain or lieutenant or whoever it is is pulling out his camera, which is illegal, and there’s three cop cars sitting in front of our building. That’s a problem for me." The video does not appear to show any officers holding a recording device, although a steady beam like that of a video light or flashlight can be seen shining within one of the cars. Several members of Stop Stop-and-Frisk began filming, and two other people from the neighborhood also filmed the encounter, she explained. The incident lasted several minutes before the police cruisers pulled away, the video shows. "I thought they were going to get out of the car and start arresting people," Gonzalez told DNAinfo.com New York. "I was very frightened. It is hard to believe they would do this." DNAinfo supplied a link to the video to the NYPD. Just last week, in a story first reported by DNAinfo, Gonzalez and Swaye attended a meeting at the 30th Precinct stationhouse only to find a flier with their mugshots and home address. Both have been arrested for protesting stop-and-frisks. "Be aware that above subjects are known professional agitators," read the flier, which also featured an NYPD shield and a seal of the NYPD's Intelligence Division. The pair have each been arrested for protesting the controversial police practice. They also film police stop-and-frisks and post them to YouTube. "Above subjects MO is that they video tape officers performing routine stops and post on YouTube," the sign said. "Subjects purpose is to portray officers in a negative way and too [sic] deter officers from conducting there [sic] responsibilities." NYPD officials have said the flier was just a way of alerting its officers how to behave since they were being filmed. Rep. Jerrold Nadler dismissed that explanation and said the flier, apparently geared at curbing political dissent, smacks of "McCarthyism" and has no place in the United States. "Law enforcement officials may not brand as enemies or agitators people who simply question their authority or speak out publicly against their actions," Nadler said. "Police officers have no business branding people as anything other than criminals or persons of interest in criminal investigations. Putting the activists’ faces on a police poster subjects them to unfair public shame and scrutiny." 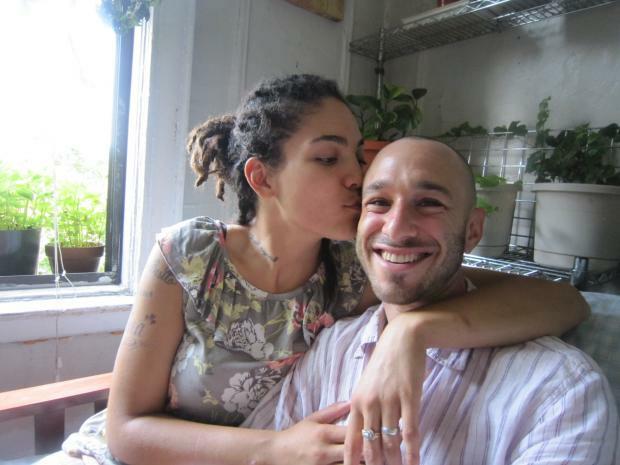 Donna Lieberman, executive director of the New York Civil Liberties Union, called the flier "disgusting" and said it could serve as an invitation for officers to show up at the couple's home and harass them. "This is emblematic of the mentality that any criticism or attempt to document wrongdoing is traitorous and makes you a public enemy," Lieberman said. "It's a recipe for disaster." Gonzalez and Swaye say that Lieberman's fears now appear to be reality. "Were they watching people as they came in? How did they hear about this meeting?" Gonzalez asked. "As I'm walking out of my front door, I'm looking at the camera in the building and wondering if police have access to it." "They were trying to intimidate us and the people who came out to show solidarity with us that they are not safe being in close proximity to us," Swaye added. Vanessa Petti, 25, a Harlem resident who is a paralegal and teacher at Rikers Island, said the incident was unnerving. "I do think our rights were violated. We were harassed, we were threatened, and it was meant to be a message," said Petti. "They came in force. It was not just one police car — it was three cars," she added. Jose LaSalle, 42, of the Bronx, who works for the Parks Department and is a member of Stop Stop-and- Frisk, said he has had five tickets for filming police stops thrown out. He said something seemed odd the moment the group exited the apartment building Tuesday night. "I got that feeling that someone is watching us. As soon as we get downstairs and get ready to leave, not more than 45 seconds later, the police pop up. They said they got a call because people were loitering," he explained. "We just got downstairs. It's impossible for three cars to get there that quick." The larger group had just split into two, each heading to the subway in a different direction, leaving Swaye and Gonzalez by themselves when the first police car arrived, quickly followed by two more, they said. The group then quickly reassembled. Swaye and Gonzalez said there was a captain present outside the apartment Tuesday night who they believe was the same person they met at the 30th Precinct stationhouse the night they saw the flier with their mugshots there. "The vendetta for them is real," Swaye said.